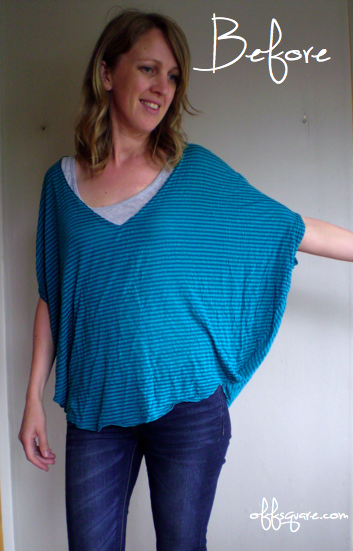 Among the treasures was this batwing top. 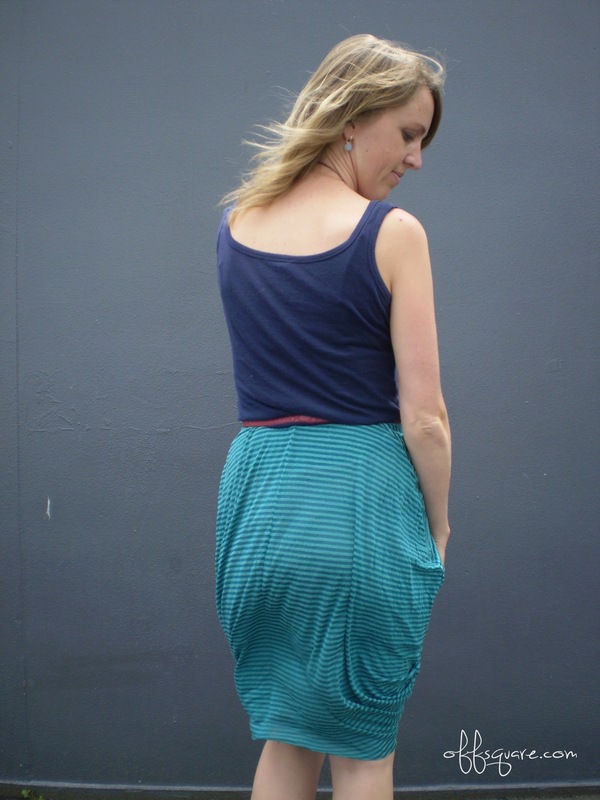 The fabric colour with the textured stripes is gorgeous! Love that. The style? It’s blah. Don’t love that. I felt shapeless and swamped. After playing around with it in the mirror for half an hour, I opted to make it into a skirt. First I stitched the armholes closed. I made a few extra tucks in the fabric at the front for pleats. When I wear it, I’ll turn the elastic over to the inside so you won’t see it. I also didn’t want any topstitching to ruin the drape effect, so I only did the one line of stitching. Lastly, I lifted the back hem a little. CUTE! I love the draping in the front. Well Done!!! love that aftershot – very model esque! Haha! Thanks Miriam 🙂 It always takes hundreds of pics to get a good one. It must look crazy to people walking past! LOVE that skirt so cute!!!! 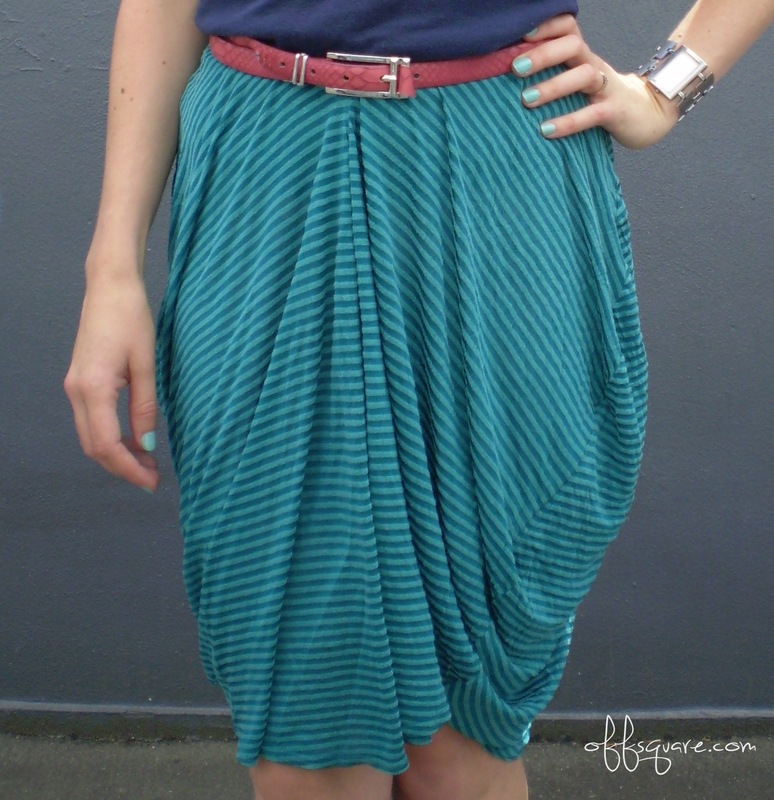 Makes me want to go out and find a big batwing top to make a skirt with! what a lovely idea. thank you for the inspiration! I like how it looks from the front! Thanks so much Cat!! Oh, I love clean outs too. It’s always like Christmas 🙂 Hope you found some new treasures to enjoy in your recent haul! I love it! Funny I saw the reverse transformation recently on another blog. 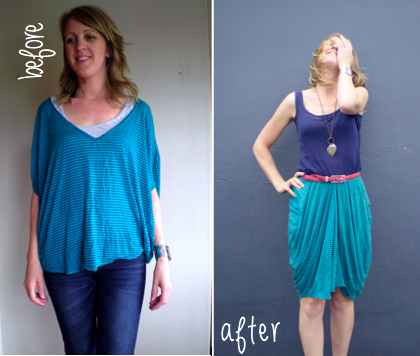 It was a skirt to a top! Yours looks lovely and comfy! Lol! That’s awesome! Skirt to top sounds tricky. Clever!